Meet my favourite orthonectid (because we've all got one, right?) Orthonectida are twenty-odd species of uncommon parasites of marine invertebrates. 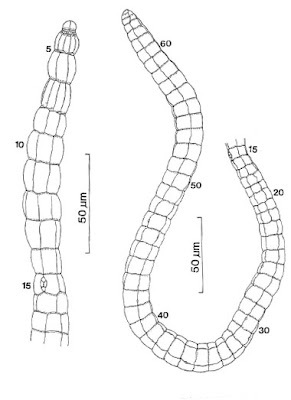 The host of Stoecharthrum giardi is the annelid worm Scoloplos armiger; most orthonectid species are only recorded from one host, but closely related species can be found in hosts of quite different phyla (other Stoecharthrum species, for instance, are found in bivalves and ascidians). As you can see from the scale bar in the drawing of a sexually mature individual above, they are extremely small- Stoecharthrum giardi, for instance, grows up to 0.8 mm in length and less than 0.02 mm in width. To match this small size, mature orthonectids have a very simple anatomical organisation; an outer layer only one cell deep contains an inner mass of developing gametes, with only a very thin layer of a small number of muscle cells between the two (Slyusarev, 2003b). Sexually reproducing individuals leave their host upon maturity to release their gametes in open water. The resulting larvae re-enter a host and produce multinucleate plasmodia within which new individuals develop from germinative cells. However, there appears to still be some disagreement whether the plasmodium represents the parasite itself (Sliusarev, 2003a) or a pathological product of dissolved host cells (Kozloff, 1997). The relationships of orthonectids with other animals are pretty much unknown - they are often classified in the Mesozoa along with the Rhombozoa, another group of marine invertebrate parasites that also have a simple two-cell-layer organisation, but the detailed nature of the cell layers is decidedly different between the two groups and their simple organisations are just as likely (if not more likely) to be the results of convergence as relationship. Similarly, authors have disagreed whether the simple organisation of 'mesozoans' indicates that they are relatively basal within animals or whether it represents a secondary simplification as a result of their parasitic lifestyle. A molecular phylogenetic analysis by Hanelt et al. (1996) placed orthonectids as sister to all other Bilateria while rhombozoans were placed separately within Bilateria, but their topology shows every sign of long-branch attraction when considered in light of subsequent advances in bilaterian phylogeny. The orthonectid family Rhopaluridae contains four genera, Rhopalura, Intoshia, Ciliocincta and Stoecharthrum*. The genera are primarily distinguished by the arrangement and morphology of the external cells. The first twenty or so rings of cells from the front of the animal (exact number depending on species) more or less alternate between bands of ciliated and non-ciliated cells (the cilia are the animal's main motile organs after it leaves the host). After that, all cell bands are ciliated, but Stoecharthrum and female Ciliocincta are the only rhopalurids really long enough to have a significant extension of the fully ciliated region. With more than sixty cell rings, Stoecharthrum is more than twice as elongate as most other orthonectids; the average number seems to be about thirty rings (oh, and in case you were wondering, the little arrangement of small cells on ring fifteen is the location of the genital pore). Stoecharthrum and female Ciliocincta also differ from other rhopalurids in having the majority of ciliated and non-ciliated cells about the same length; in Rhopalura and Intoshia, the non-ciliated bands are noticeably narrower than the ciliated bands. The primary difference between Stoecharthrum and Ciliocincta, other than Stoecharthrum's greater length, is that Stoecharthrum is the only orthonectid genus in which individuals are hermaphroditic rather than having separate male and female sexes. *The only non-rhopalurid genus assigned to Orthonectida is Pelmatosphaera, for which I haven't seen a figure. Kozloff (1992) doubted whether Pelmatosphaera was truly related to Rhopaluridae but didn't suggest any alternative placement. Hanelt, B., D. van Schyndel, C. M. Adema, L. A. Lewis & E. S. Loker. 1996. The phylogenetic position of Rhopalura ophiocomae (Orthonectida) based n 18S ribosomal DNA sequence analysis. Molecular Biology and Evolution 13: 1187-1191. Kozloff, E. N. 1997. Studies on the so-called plasmodium of Ciliocincta sabellariae (Phylum Orthonectida), with notes on an associated microsporan parasite. Cahiers de Biologie Marine 38 (3): 151-159. Sliusarev, G. S. 2003a. [Orthonectida's life cycle]. Parazitologiia 37 (5): 418-427. Slyusarev, G. S. 2003b. The fine structure of the muscle system in the female of the orthonectid Intoshia variabilis (Orthonectida). Acta Zoologica 84: 107-111. I don't understand why there's so little work on these critters. The origin of the Bilateria is one of the great mysteries of biology, and basal groups like orthonectids and placozoans are our best views into how it happened. Now that sequencing genes is relatively cheap, shouldn't the molecular phylogeny of the stem-bilaterians be a priority?